Protect you and yours with the brand of ammunition trusted by law enforcement internationally. 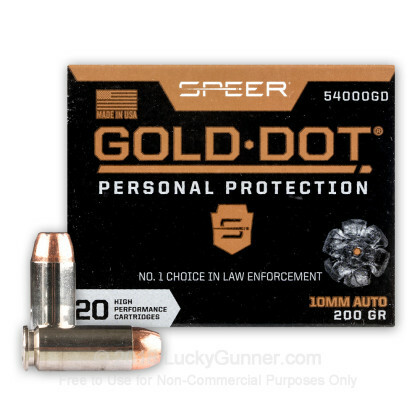 Speer Gold Dot manufactures this premium 10mm auto ammunition to be fiercely accurate and reliable in life-threatening situations. 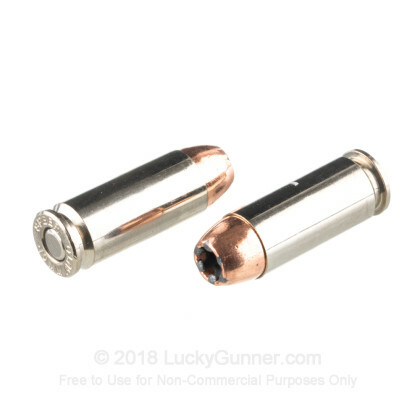 The heavy 200 grain jacketed hollow point (JHP) bullet causes deep wound channels as a result of Speer's Uni-Cor bonding process, while the hollow point mushrooms into a formation you can count on each and every time. 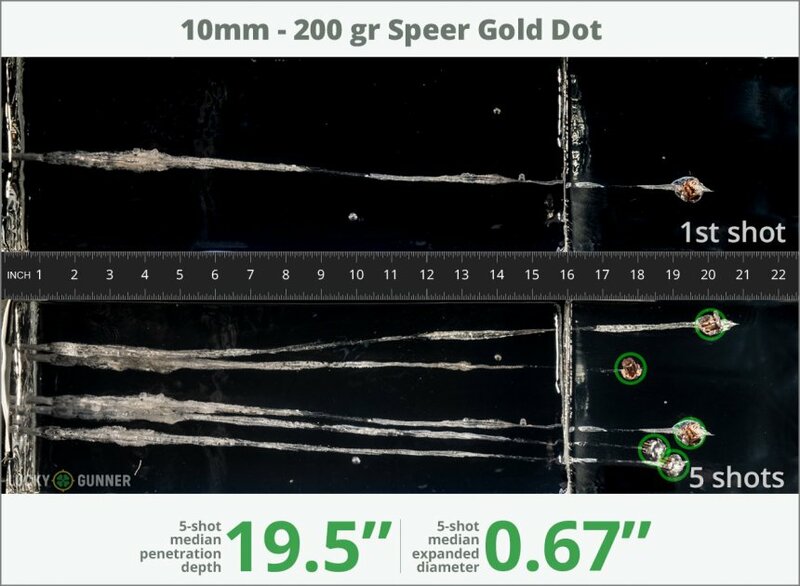 Speer uses only the best components when crafting their Gold Dot self-defense ammo. These cartridges are packed into Boxer-primed, reloadable nickel-plated brass casings. These are the casings of choice for many shooters because of their reliability in the chamber, and their anti-corrosion properties that give them a long shelf-life. Shooters can feel Speer's 70+ year's of experience when firing these premium self-defense cartridges. The meticulous quality control required when crafting duty ammunition should make you feel very confident when loading these rounds into your handgun. 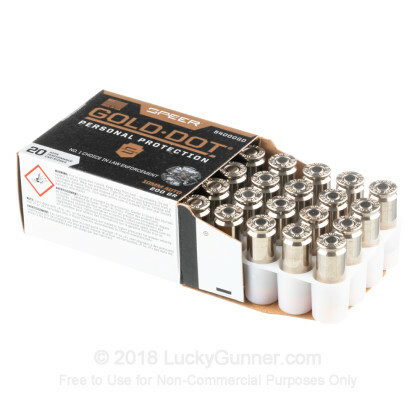 Order 20 rounds of this premium 10mm Auto ammo today! Ballistic gelatin testing is one way to get an idea of how a self-defense load might perform in a real world self-defense situation. So we fired five rounds of Speer 200 gr Gold Dot from a Glock 20 from a distance of 10 feet into a block of synthetic ballistic gel with a barrier of four layers of fabric simulating heavy clothing. We then gathered information on the expansion and penetration characteristics of this load. That data is represented in the chart below. How this load compares to other 10mm Auto loads from our tests in regards to bullet expansion and penetration can be found in the diagrams at the bottom of the page. 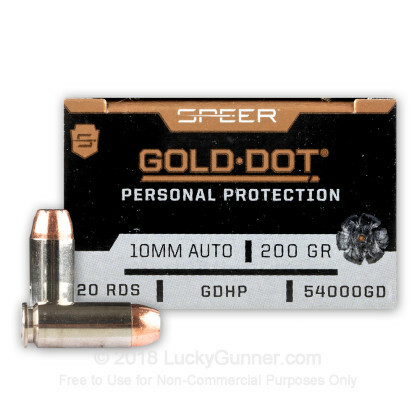 How do the results for this Speer 10mm Auto compare to other 10mm Ammo? 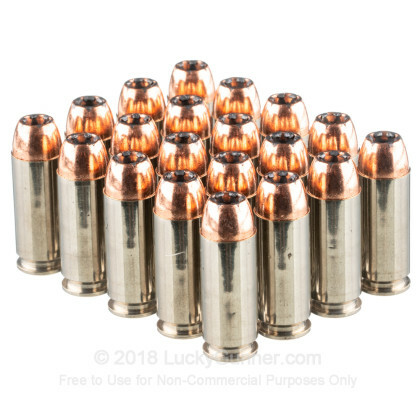 0.81" This ammo: .68" Min: 0.4" Median: 0.63" Max: 0.81"
19.5" 0" 11.7" 18.6" 48" This ammo: 19.5" Min: 11.7" Median: 18.6" Max: 48"
100 % function rate out of my Gen 4 Glock 20 with both the stock barrel and a 6" KKM stainless aftermarket barrel. Accuracy was very good out to 25 yards. Ammo chrono'd a muzzle velocity of 1036 fps for the stock Glock barrel, for 476 ft lbs. The 6" barrel produced 1128 fps with 564 ft lbs at the muzzle. 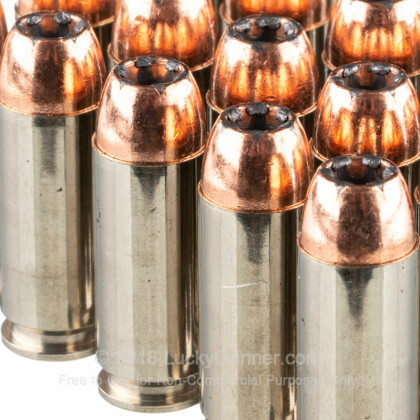 While not the full blown super 10mm ammo, this factory ammo with the proven Gold Dot bullet, is controllable, powerful, accurate, and reliable, which makes it great for use as a defense weapon.